Marquis, the first approved treatment for equine protozoal myeloencephalitis (EPM).Treat EPM with confidence. Marquis is FDA-approved. Ponazuril, the active ingredient in Marquis, crosses the blood/brain barrier to reach the central nervous system where it kills Sarcocystis neurona,1,2 and stops parasite from inflicting further damage to the central nervous system. Concentrations achieved in the CSF at steady state were shown to kill 94% of merozoites in cell culture. Marquis is easy to administer and safe when used as directed. Marquis is safe to use in horses, causing few adverse effects. Its pre-calibrated oral dosing syringe ensures accurate delivery of each dose. 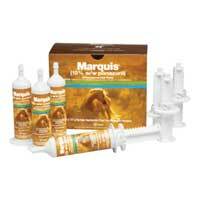 Marquis is easy to administer correctly; the horse owner can give the full dose each time. Using the labeled dose of 5 mg/kg for 28 days, 60% of horses improved at least 1 grade at Day 118, of these 75% were corroborated successes by video tape assessment.